Among readers, the ideological arguments about guns continue, but more people see this as a time to reduce violence by controlling access to guns. There may never be total agreement, but more and more people are unwilling to let the killing continue without a response that includes reducing access to killing tools. I want to share thoughts from some of the emails I got last week about a column following the mass shooting at a high school in Parkland, Florida. After Parkland, the idea of arming teachers surfaced again, and most of you took issue with that suggestion. A reader named Chuck lampooned the notion of teachers armed with pistols trying to stop an assailant with a more powerful weapon, and possibly wearing body armor, and doing so in the presence of many students. He said schools might just as well arm teachers with hand grenades. He concluded that arming teachers in any fashion would be foolish. I agree. Protecting schools and other public places from potential gun violence can be costly. Ellen suggested that gun owners pay an annual tax on each gun they own to support measures to keep the general population safe. That would have no impact on people who use a gun to kill themselves. Nor would it likely affect crimes of passion. And mass shooters very often kill themselves or are killed by police. That doesn’t leave many people to be deterred beyond those who are already deterred by the thought of prison. Another reader blamed gun violence on liberals, who he claimed have corrupted the country’s morality. One reader, who said his suggestion was far-fetched, wrote that, “Since so many NRA members try to instill fear and distrust of our government which often leads to violence, it would be great if the NRA was designated as a terrorist organization.” Well, maybe it’s not that far-fetched. Last month, a reader suggested families hurt by gun violence sue the NRA, the way some victims of hate crimes have sued KKK groups. It’s clear there is a big gulf in opinions about guns. Not everyone is going to engage in conversation across the gulf, but some readers thought we should try harder. A reader named Mike suggested “gun reform” would be a more palatable term. Regardless, this feels like a moment when people who support restrictions on access to guns can, and should, speak more forcefully. Polls after the shooting in Parkland show a sharp increase in the percentage of Americans who want tougher gun control laws. In a Quinnipiac University poll reported last week, the percentage went up 20 points from where it had been at the end of 2015. 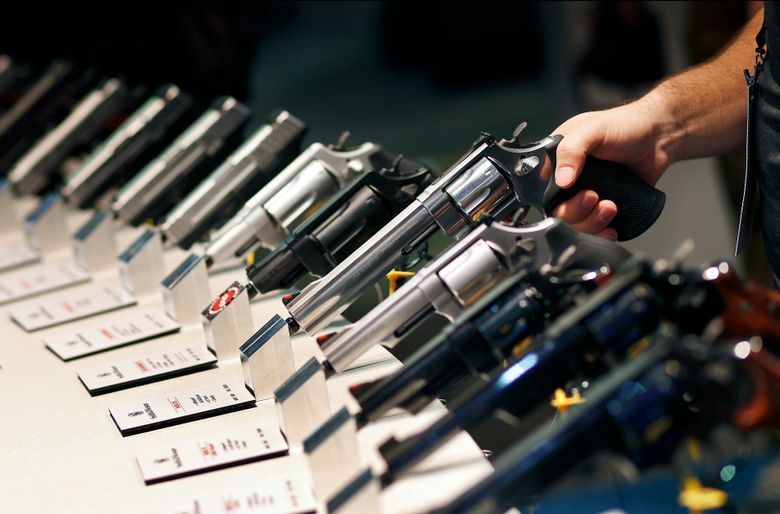 Sixty-six percent of people polled want stricter gun control. Some readers were looking for ways to help make that happen. You can help by holding lawmakers accountable and adding your voice to the messages they get demanding action to reduce gun violence. There are a number of organizations that can provide information and suggestions for writing to lawmakers. You can find contact information for the Washington state Legislature online. The Brady Campaign is a good national resource. It was started by Jim and Sarah Brady after Jim was shot and partially paralyzed by a shooter attempting to assassinate President Ronald Reagan. Brady was Reagan’s press secretary. Protecting people from gun violence hasn’t always been a matter of left or right. It’s time for people who want a safer society to move past the ideological side chatter and make it happen.